Smartphone technology is advancing at an exponential rate, and so are its accessories. As we know, a wide range of accessories are available for mobile phones ranging from headsets to chargers, cables, cases, covers, screen guards, power banks and likes. Due to intense use of smart phones, their battery doesn’t last for the whole day, and you have to look for a fast charging power source. So in this post, we have covered best quick charge 3.0 car charger. But what is QC 3.0 ? Quick Charge 3.0, which is a technology found in Qualcomm “Snapdragon” systems-on-a-chip which is available for fast and reliable smart phone charging making it quick and easy to top up your bed. Based on such an innovative idea and started with Quick Charge 1.0, the first fast charging solution featuring up to 40% faster than conventional charging and then followed by Quick Charge 2.0 featuring a charge time advantage up to 75%, the latest version Quick Charge 3.0 can charge compatible devices up to four times faster than a conventional charger. What a big step and what good news for fast-battery-consuming phone users! How does Quick Charge 3.0 work? Employed with Intelligent Negotiation for Optimum Voltage (INOV), Quick Charge 3.0 can in-time determine what power level your portable device requests and then enable optimum power transfer in maximized efficiency. 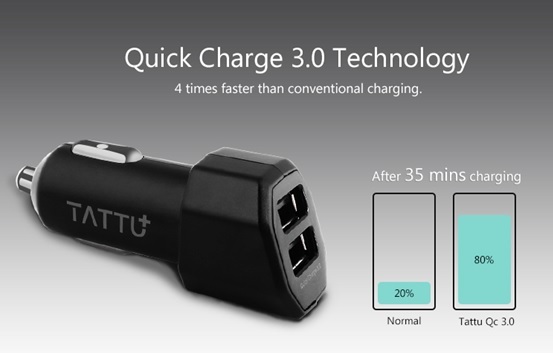 So, let’s look at this Tattu quick charge 3.0 car charger. 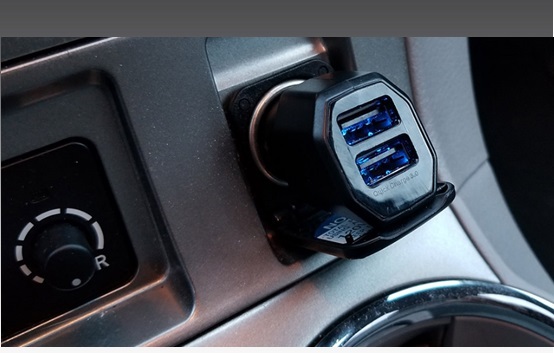 This is a black car charger, and looks pretty minimal. One thing I do like about this adapter with angled design which is subtle but useful to keep the cables angled towards the device and not have the cable bend from a straight angle. And mental slide -proof in two sides makes a more solid connection. And with soft LED indicator stands out in the dark, which guide you to find the ports and not distractive. This charger has two USB-A ports, as you can see, there's the Qualcomm Quick Charge logo beneath the bottom one, showing that, indeed, it's the one with QC3.0. And the top one is 5v/2.1A. Combined it offers max 30W output, enough to charge two iPads. It will automatically assess the connected device to assign appropriate current for that device. Output can range from 3.6v to 12v. Input is the usual 12-14V. I've been looking for a new Quick Charge 3.0 compatible charger since I do a lot of driving and while my Samsung S8 Active has the stock 4,000 mAh battery, I always like to keep it plugged in for emergencies. My S8 Active also recognized the quick charging capability and charged just as fast as the wall charger I have at home. But if your phone doesn’t support quick charging then still this chargers will work as regular chargers. 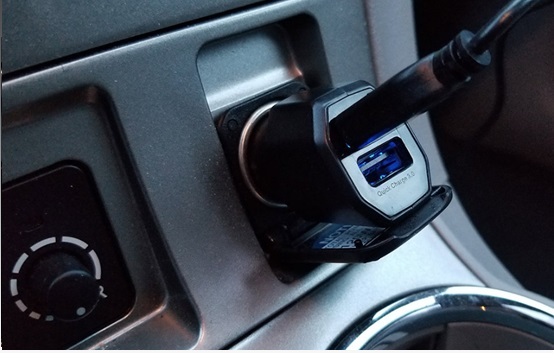 I'll probably get another one as I have multiple devices in my vehicle and make it streamlined with a cigarette adapter. Considering so many points, you can’t go wrong with this QC 3.0 car charger. You can buy it on Amazon US or Amazon UK .